Meet Gianni (Gianni Di Gregorio), a middle-age bachelor living with his elderly mother (Valeria De Franciscis) in Rome. 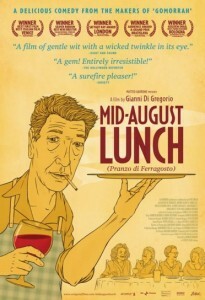 Gianni has a love of wine and a few financial troubles, including debts on their apartment, and thus is stuck in Rome during the Pranzo di Ferragost, a big annual Italian festival (which also happens to be the name of the film in its native county). He soon finds himself taking in his building manager’s mother (Marina Cacciotti) and aunt (Maria Cali) and his doctor’s mother (Grazia Cesarini Sforza), for the weekend, and must cater to their whims and idiosyncrasies in his tiny apartment. For example, one woman makes a killer pasta dish, but another isn’t supposed to eat pasta or tomato sauce. You can see where this is headed, but it’s still deliciously (pun intended) funny. 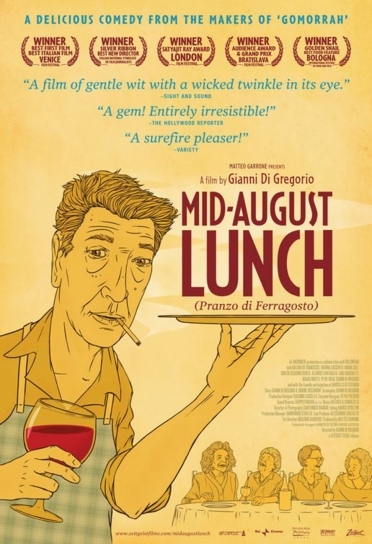 Veteran screenwriter Di Gregorio (Gomorrah) makes his directorial debut with Mid-August Lunch, and he delivers great shots of Rome and delightful performances by a group of mostly non-professionals, along with all the food footage one would expect. And at 75 minutes, the movie shows that the actor/director/screenwriter knows when to say cut and how to keep the story lean. Cross Big Night with The Golden Girls, and you might get close to capturing the essence of this film gem. The modest supplemental package on the DVD also is a lot of fun and features the recipes for many of the dishes that look so luscious in the film. Megan Quinn is a former contributing editor and movie reviewer for Video Business magazine. She has a journalism degree from the University of Missouri, which she puts to good use raising money for nonprofits in New York. Most importantly, she is Henry’s mom.